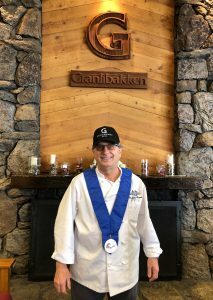 Granlibakken Tahoe’s Executive Chef Ron Eber has received recognition once again for his culinary innovativeness and expertise. 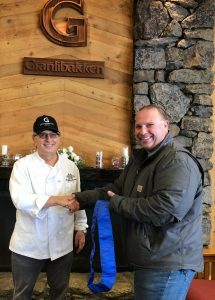 Chef Ron has been working as the Executive Chef of Granlibakken Tahoe since 1978, and has wowed guests with his innovative cuisine as well as his adaptability to new trends and dietary needs. Chef Ron takes great pride in his work, and is constantly striving to create new dishes and to remain involved in the local culinary community in Northern California. He has received numerous accolades and awards for his work, both regionally and statewide. The American Culinary Federation High Sierra Chapter was founded in 1976. Its goal is to promote and improve the quality of the food industry in the Northern California and Western Nevada regions. The ACF High Sierra Chapter serves to connect chefs in the region, while fostering educational and promotional programs for the culinary industry. As a member of the ACF High Sierra Chapter, Chef Ron has engaged in dialogue with other chefs about how to remain current in the industry, and has also served as a mentor and a friend to many local chefs. We are so pleased that Chef Ron has been recognized for his hard work and commitment to the culinary industry. Granlibakken Tahoe is known for its food—thousands of guests have enjoyed creations by Chef Ron through the daily breakfast included for all guests, as well as through Granlibakken’s all-inclusive conference packages. Chef Ron has retained a passion for his profession that is unequaled, and his contribution to both Granlibakken Tahoe and the larger culinary community is vast. This entry was posted in gutenberg, News & Updates, Uncategorized, Weddings. Bookmark the permalink.